What is the foremost racing series in the world? If you said Formula One, you are in the company of most other enthusiasts. The series consists of a yearly Grand Prix in each participating country (although in a few instances, there was more than one). Even though the Formula One series was started in 1950, the concept of having a country’s premier event began long before that. The first one was held in 1906 near the city of Le Mans in France. The first in the U.S. took place in 1908. Before that, the premier series in the U.S. was the Vanderbilt Cup. The Cup events were run according to the internationally-recognized regulations of the Association Internationale des Automobiles Clubs Reconnus (AIACR). The 1907 Vanderbilt on Long Island however, was cancelled due to spectator deaths and injuries there the previous year. It came back in 1908, but the American Automobile Association (AAA) adopted different regulations than those of the AIACR. Whereupon, the competing Automobile Club of America (ACA) decided to sponsor a new series, the American Grand Prize, using AIACR rules. A number of cities proposed hosting the first event, among them Los Angeles, Philadelphia and Atlanta. Even though Indianapolis offered considerable up-front money, beautiful and picturesque Savannah, Georgia was selected by the ACA. The race was scheduled for Thanksgiving Day, November 26, 1908. It was run by the Savannah Automobile Club which had previously staged a stock-car event and the club planned a version of the 17-mile stock-car course lengthened to 25.13 miles. Georgia Governor M. Hoke Smith had convict labor re-surface the road with oiled gravel. The result was so first-rate that President Taft brought leaders from all over the country to view it as a model. In addition, the governor sent state militia personnel to help the city police with crowd control. First-aid stations were set up all around the course manned by 30 doctors. Some sixteen hundred marshals kept things under control. The course was laid out on city streets south of the historic downtown district. A large spectator stand covered two entire blocks on Estill Avenue. Now named Victory Drive, its four lanes of cross-town traffic are lined with Savannah oak trees showered in Spanish moss. Somewhat over 250,000 showed up to watch cars race for 402 miles over 16 laps. Horace Dodge and Henry Ford came to watch as well as the president of Firestone Tires, who slept in the city jail because all other accommodations were filled to capacity. Merchants and hoteliers were ecstatic. Twenty cars from the U.S., Italy, France and Germany vied for the first American Grand Prize Cup. Entries came from all over the world including factory teams from Renault, Fiat and Benz. Top pilots of the day included Ralph DePalma in a Fiat and the first Grand Prix winner, Ferenc Szisz, in a Renault. Rather than go off all together, each car was started every 30 seconds. (Staggered starts were common in those days of long-distance open-road events.) DePalma led from the beginning, setting the fastest lap at 21:36.0, but then slowed with mechanical problems and finished in ninth overall. 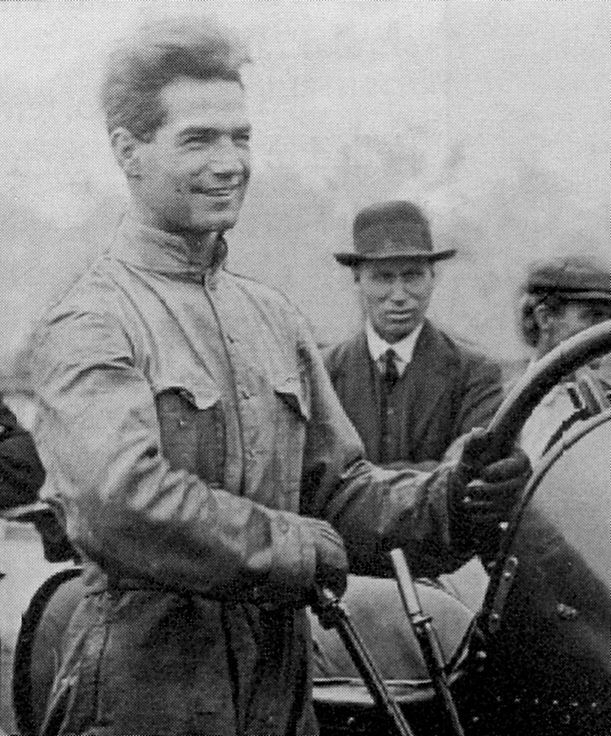 Rene Hanriot in his Benz took the lead until a slow pit stop allowed Louis Wagner in a Fiat to pass. He was closely followed by Victor Hemery in another Benz and Felice Nazzaro in a second Fiat. A fierce duel took place with all three less than a minute apart, each taking the lead at one time or another. At the finish, Hemery was first, but because of the staggered start, Wagner, who had started six minutes after Hemery, was the actual winner. He covered the 16 laps in 6 hours, 10 minutes and 31.4 seconds. Hemery crossed the line 56.4 seconds later with Nazzaro third. After the race when Rene Hanriot backed up on the course to return to his pit, his tires were shot out by a member of the militia. American-built cars didn’t fare well; none managing to finish. Entrants in the 1908 Grand Prize at Savannah started at 30-second intervals. Len Zengle in his Acme is lined up ready to go. He retired after seven laps when a spring in his suspension broke. 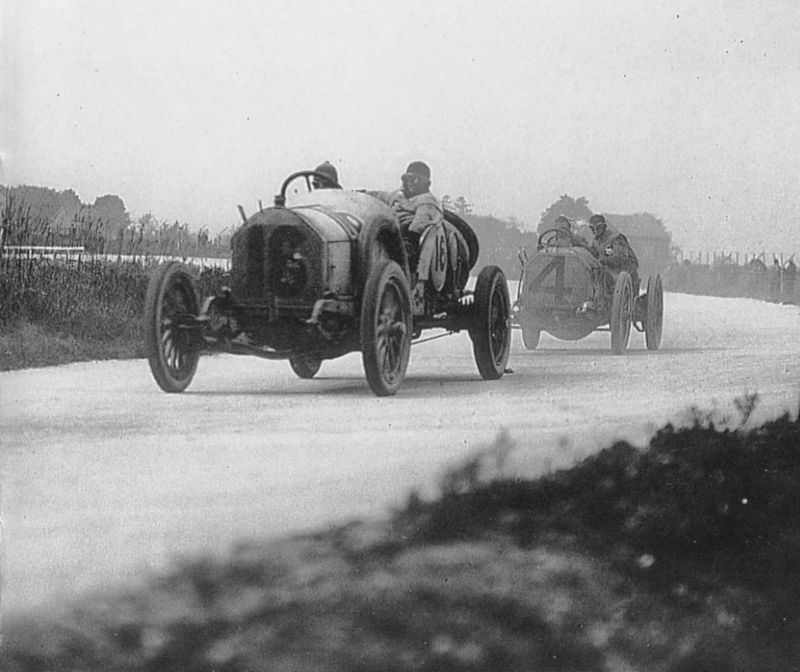 Louis Wagner in his Fiat leading Ralph Mulford in his Lozier. Wagner won and Mulford failed to finish. 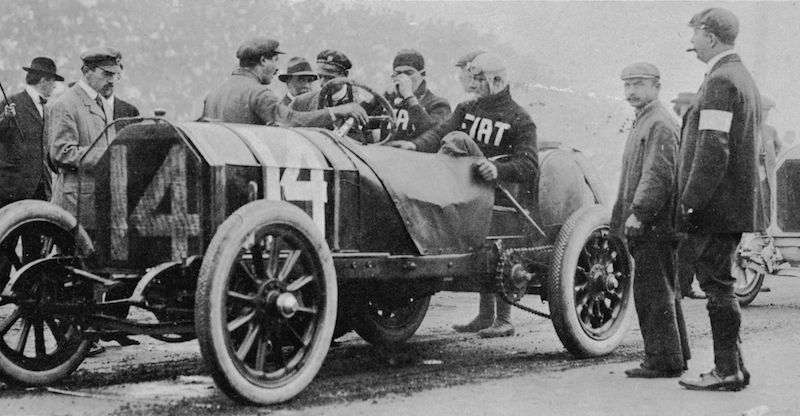 The winner of the first American Grand Prize at Savannah, Georgia was Frenchman Louis Wagner (at the wheel) in his 120 bhp Fiat. After the successful Savannah event, the ACA planned to run a second one the following year on Long Island in conjunction with the Vanderbilt Cup. 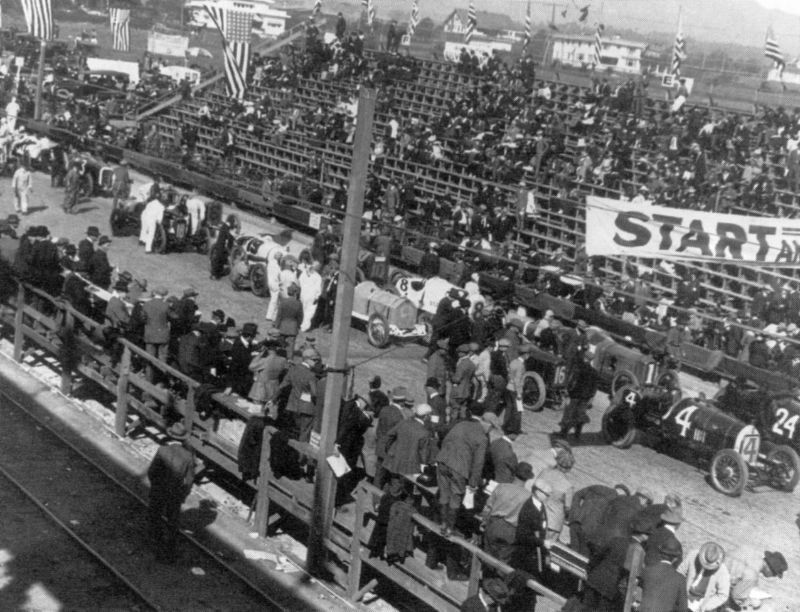 It failed to materialize however, so the next race in the series was held at Savannah on November 12, 1910. A shorter 17-mile course was laid out. Victor Hemery in a Benz led off followed by Arthur Chevrolet. 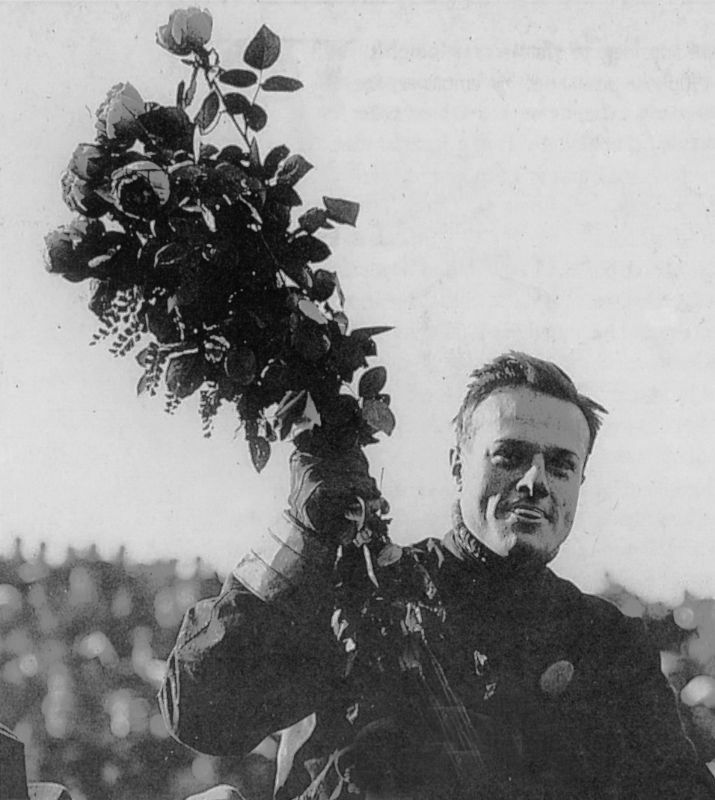 Then Felice Nazzaro passed Chevrolet setting a lap record. Next Louis Wagner took the lead, but ran into a tree on the 17th lap. Ralph DePalma inherited first with David Bruce-Brown close behind. On the last lap, DePalma’s engine suffered a cracked cylinder allowing Bruce-Brown to pass and win. This time, more than a half million spectators crowded into the small city. The 1911 Grand Prize was held at Savannah and Bruce-Brown won again. 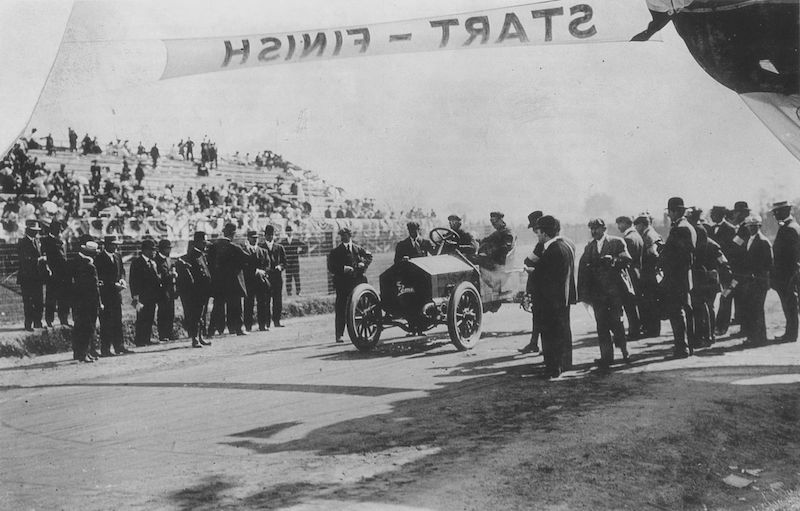 When Savannah failed to come up with enough prize money, the 1912, the race moved to Milwaukee. (Not on the famous Milwaukee Mile which opened in 1903, but on a 7.88-mile road course on the outskirts of the city.) Unfortunately Bruce-Brown was killed there in practice. There was no American Grand Prize event in 1913. In 1914, it went to Santa Monica, California, then to San Francisco as part of the 1915 Worlds Fair and finally, back to Santa Monica again in 1916. That year marked the end of what was known as the Grand Prize era. David Bruce-Brown won the 1910 American Grand Prize at Savannah in his Fiat on November 12, 1910. David Bruce-Brown won both the 1910 and the 1911 American Grands Prize. 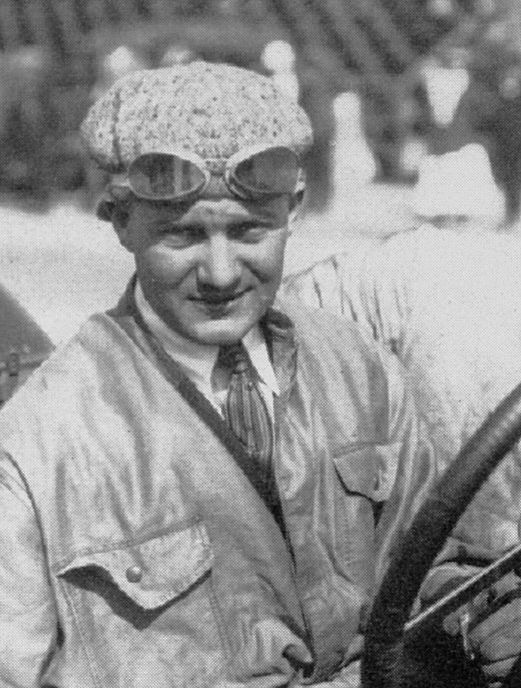 Ralph DePalma won the Santa Monica Vanderbilt Cup race that took place two days before the Grand Prize in the Schroeder “Grey Ghost” Mercedes. But the best he could do in the GP was fourth, 95 minutes behind Eddie Pullen. Eddie Pullen won the 1914 American Grand Prize in the streets of Santa Monica, California in his Mercer. Cars lined up on Ocean Avenue in Santa Monica prior to the start of the 1916 Grand Prize. 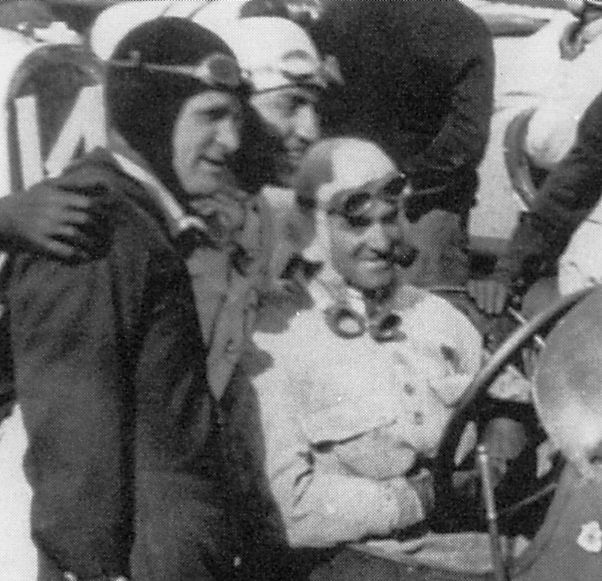 Eddie Rickenbacker (left) giving some advice to Dario Resta (at the wheel). Rickenbacker stripped the gears in his Duesenberg during the November 18, 1916 Grand Prize and failed to finish. Resta won the Vanderbilt Cup on November 16, but also failed to finish in the GP. Rickenbacker won the Medal of Honor flying in WWI. 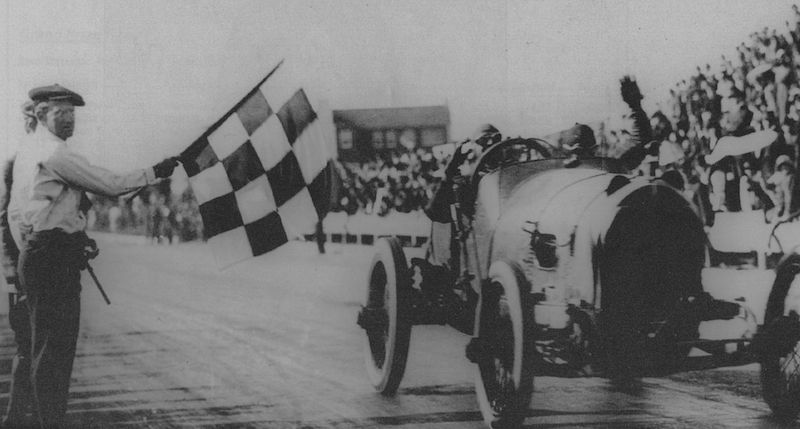 Even though Johnny Aitken took over before the half-way point, Howard “Howdy” Wilcox in a Peugeot was given credit for winning the November 18, 1916 American Grand Prize at Santa Monica. Great summary of U.S. GP history and photos! Especially interesting are the crowd data on early 20th century race events, which you touched on a bit. In the days before television, radio, and now, the Internet, live events such as auto races commanded huge crowds and wide coverage in newspapers. Oh, to be able to time travel back to this era! One small but significant error. Formula One did not start in 1950. The World Championship for Drivers started in 1950; Formula one was the formula to which it was run. Formula One existed long before, as the top category in the international classifications of racing. Complicated I know, maybe even confusing, but not to be interchanged as they were not the same thing back then. Incidentally, the Centennial of the 1912 United States Grand Prize (as it was called then) and Vanderbilt Cup races, run on a street course in Wauwatosa, Wis., just outside Milwaukee, is this year. The events are to be commemorated at both the Millers at the Mile extravaganza July 6-7 and the Milwaukee Masterpiece Concours on August 25-26. John Haydon has researched these races extensively and has written a small but informative book on the Milwaukee races. I remember the excitement that accompanied the coming of F-1 to our shores for the USGP at Sebring in December 1959. The field was somewhat reduced by the long trip from Europe but both Cooper and Ferrari were there with factory cars. Ferrari even made a special concession to Phil Hill by painting his car in blue with a white nose. There were traditional red ones for Von Trips and Tony Brooks. Sterling Moss was there in his privately entered (I think it was in Ecurie Ecosse colors) Cooper with a combination of wire and alloy wheels and of course the factory cars for Brabham and McLaren. There were a number of unusual cars such as the central seater Porsche F-2 car and Roger Ward’s #1 midget car. Ward spent much of the time sliding on and off the road in spectacular fashion. It was less than an exciting race but for US fans it was a thrill to see the legendary F-1 cars on our shores. The photos I took there are among my favorites from the period. You were fortunate to have seen the race; judging from the gate, not many did! I like your observation about the Phil Hill Ferrari being blue with white trim. That is something that has been lost and forgotten over time, and I would wager that you are one of the few that know it. Good comments TJ Schultz and think you are correct. i also viewed the first post war F1 race at Sebring and agreed that the color was indeed a rich Blue with a white spear on the mouth of the car. Also remember reading that the engine was a “Dino” as it had one canshaft per bank instead of the two Ferrari used all season. Am curious about the Vanderbilt Cup race race on a course on the streets of Wauwatosa. I have lived here since 1950 and already a race fan and interested in the history of the sport, but have not heard of this until now. I heard that such a race was run near Elgin, IL. Would really like to know just were the course was. Because those Watkins Glen events were not true “Grand Prix” races. They were sports car races. This article is about the United States Grand Prix as not only Formula One events but also as World Championship races. As noteworthy, great, and significant as the early Watkins Glen races were, they do not qualify under the criteria being used for this article. Watkins Glen did run the World Championship USGP in the years 1961-1980 as noted. Wonderful article and a fun read. Thank you very much, I really enjoyed it. “Dino ” denoted a six cylinder engine, not the number of camshafts. Small point.